Over on archaeology.org in their archive section, check out the artificial toe from approximately 950—710 B.C. made from Wood and leather and discovered in the tomb of Tabeketenmut located in the necropolis of Thebes, near Luxor. It is about 4.7 inches, from tip of toe to point of attachment, and is currently located in the Egyptian Museum, Cairo. See a bit more here. Also, on smithsonianmag.com, they want you to "Get Lost in the World's Largest Maze" here. The Masone Labyrinth is located in the northern Italian city of Parma. It is "a 20-acre, star-shaped bamboo labyrinth that winds its way around a golden pyramid." Mapping it must be a difficult task. 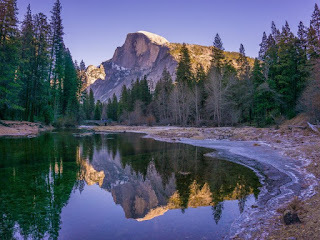 Finally, on smithsonianmag.com, as well, they ask, "How Did Nobody Notice Five Million Pounds of Rock Fall Off Half Dome?" Apparently, a large portion of the famous monument sheared away and it was realized until some hikers familiar with how the area should look happened by the rubble below. Find out more here.